The 15 essays in ‘Architecture as a Craft’ present a vision of the architectural discipline in which the essence is sought in the craft itself. The book is based on the symposium of the same name that the Delft University of Technology organised in 2009. The authors include the architects Michiel Riedijk, Sou Fujimoto and Gregg Pasquarelli. 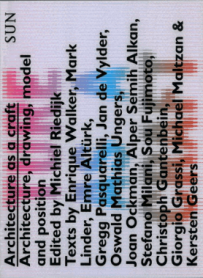 Architecture as a craft, with texts by: Michael Maltzan, Enrique Walker, Joan Ockman, Giorgio Grassi, Kersten Geers, Oswald Mathias Ungers, Emre Altürk, Gregg Pasquarelli, Sou Fujimoto, Mark Linder, Jan De Vylder, Alper Semih Alkan, Stefano Milani, Michiel Riedijk and Christoph Gantenbein.